The predicted number of missing people has been lowered from 1,200 to about 200, officials say. The damages are adding up, however, with an estimated $2 billion in property losses. Two more people were presumed dead as the number of people unaccounted for from Colorado's devastating flooding continued to fall, authorities said Thursday, raising the number of confirmed or presumed deaths to 10. The Boulder County Coroner's Office said a body found near Lyons had been identified as that of Gerald Boland, 80, of Lyons, who spent 30 years at Lyons Elementary School as a math teacher and a basketball coach. His truck was found abandoned Tuesday. A 46-year-old man in Drake — in Larimer County, one of the hardest-hit regions — was confirmed missing and presumed dead Thursday after his home was washed away Sept. 14, the county sheriff's office said. It didn't name the man. Friends and relatives told NBC News that Boland and his wife, Cheron, got separated as they fled the rapidly rising waters north of Denver in two vehicles last week. Before the body of Gerald Boland was identified Thursday, his family talked about the longtime teacher. NBC's Kate Snow reports. "I had to turn around and sat at the parking lot of a restaurant, thinking he'd come right by," Cheron Boland told NBC News on Wednesday as she waited for word on her husband. "I thought he was right behind me." Instead, Gerald Boland had gone to a shelter at Lyons Elementary and then set out in his truck to find his wife. He wasn't seen alive afterward. Statewide, six other people have been confirmed dead after last week's biblical flooding, and two others in Larimer County have been declared missing and presumed dead. As electric and phone services have come back online, many people previously presumed missing have made contact with relatives, friends or rescue crews. Only about 200 people remained unaccounted for Thursday — down from a high of about 1,200. With urgent rescues dwindling, authorities began shifting their efforts toward assessing the damage and the billions of dollars it will take for the state to recover. 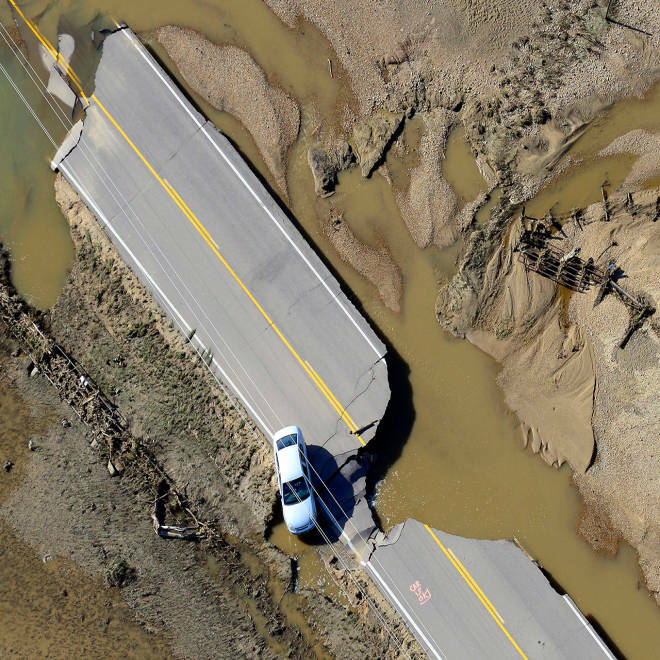 Days of heavy rainfall flooded Colorado mountain towns, obliterating roads and leaving many people stranded. In Larimer County, 28 more people were rescued Wednesday, the county sheriff's office said, but 139 were still missing. Others were refusing to leave their homes despite warnings from the U.S. Forest Service and the state Wildlife Division that they could be cut off from essential services for weeks. "I know the kind of people that live up there," Sheriff Justin Smith told The Denver Post. They are very independent and can take care of themselves, but there are some who aren't as self-sufficient as they might believe they are. "They can live up there as long as there's power and they can get in and out. They say they appreciate the federal offers to put them up in a hotel, but they say: What would I do in a hotel? This is my life up here. I have to find a way to continue my life up here. I'm not asking for a lot, just the ability to take care of myself.'" Ten helicopters were still flying rescue missions, down from a high of about two dozen. Some of the helicopters that have been used for emergency airlifts may be returned to Fort Carson, where they will be on standby, Colorado National Guard Lt. Mitch Utterback said. Experts began totaling the long-term damage. Property losses alone could hit $2 billion, the catastrophe modeling firm Eqecat said Wednesday in its first comprehensive estimate. Projected losses for residential property alone are about $900 million. Most of the overall losses are uninsured, the firm said. And state officials were wrestling with a new threat: oil spills. Six teams from the state Oil and Gas Commission were Five teams of inspectors and environmental protection specialists were canvassing flood-hit areas tracking at least 10 oil spills that have released almost 14,000 gallons of petroleum products. The biggest — 13,550 gallons — was at an Anadarko Petroleum Co. storage tank north of Firestone on the St. Vrain River, the commission said. Meanwhile, volunteers filled sandbags and built a dike overnight in the northeastern town of Ovid, preventing serious flooding when the South Platte River crested Wednesday morning, Sedgwick County emergency management Director Mark Turner said. The river rose to a record 10 feet near the Colorado-Nebraska border, and some flooding was reported near the Nebraska town of Big Springs. The plains areas of eastern Colorado and western Nebraska is largely rural farmland, which far limited the damage compared to the devastation in the mountain communities to the west.